Eric L. Freedman, M.D. received his bachelor degree from UC Berkeley and his M.D. from Johns Hopkins. He then completed his orthopaedic residency at UCLA and took his fellowship in hand and upper extremity at the University of Florida. 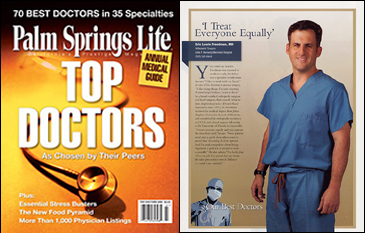 He has been awarded Top Doctors honors by Palm Springs Life magazine every year since it was established in 2005. With our office located in Palm Desert, California, Desert Hand Associates offers friendly, respectful, and skilled professional services. Desert Hand is the only medical practice in the Coachella Valley specializing in hand surgery and can deal with an exciting array of hand and upper extremity problems that for the most part have an excellent response to treatment. Arthritis is a general word used to describe inflammation ("itis") of a joint ("arthr"). Of all joints in the human body, arthritis of the hand is one of the most common locations. The hand skeleton is made up of many bones that form its supporting framework. This frame acts as a point of attachment for the muscles that make the wrist and fingers move. A fracture occurs when force is applied to a bone that is enough to break it.